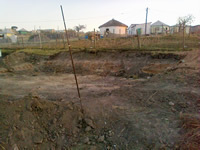 This is a ‘blocked’ project of 552 houses implemented by the ADM (Amathole District Municipality) The first contractor appointed by the ADM failed to complete the work leaving behind some 363 houses that are either incomplete or requiring major rectification work. 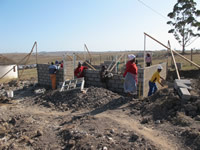 In July 2010 the ADM appointed Amanz’abantu Services to construct only 110 new houses including a contingency for some rectification work. The appointment (Contract Value) was for R12 million out of a Tender Sum of R35 million. This is a rural housing project with houses spread out over a relatively large area in undulating terrain. 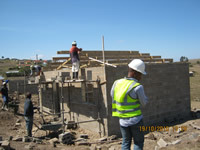 Procurement of materials and labour resources were put in place. 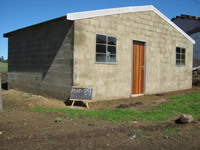 The community centre was renovated and served as the site office. 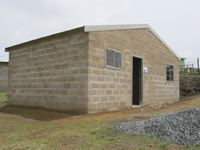 The half-built community resource centre was completed and served as the site store. 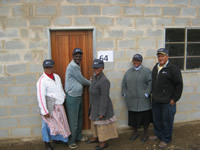 Identifying and verifying beneficiaries and marking out houses positions and orientation. 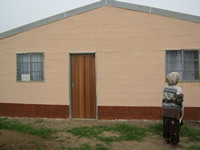 The project was completed in 4 months. 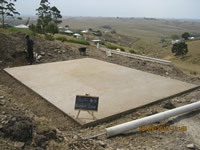 This work was carried out by a sub-contractor (Dumco cc). Cutting of Platforms was carried out using 2 TLB’s. 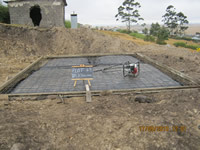 Reinforced raft foundations were constructed on the platforms. Most of the houses were on steep inaccessible slopes so the platforms excavations were quite extensive. There was no electricity or water on site – water had to be carted in using water carts and generators were used for electricity. Access roads had to be formed where necessary. 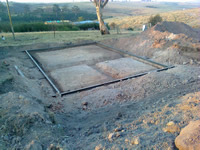 Initially Abaphumeleli (an ‘emerging’ contractor) was appointed for all top structures. However after 3 weeks of poor performance their contract was terminated. 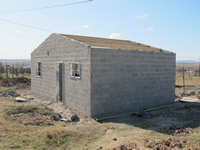 The intervention plan involved splitting the top structure milestones into blockwork, roofs and finishes. 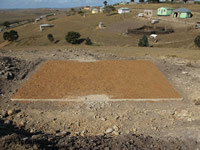 This work was completed by smaller labour-only contractors (including local contractors) working under Amanz’abantu supervision. Material procurement and good stores control. Establishing and maintaining a good relationship with the community and its leaders. The success of any business lies in its ability to secure payment for services rendered. Regardless how good the service has been – without payment the project cannot be deemed a success. For Teko Springs this remains so. 10 months after completing the project, the ADM have yet to pay the final certificate.